A comprehensive set of hand-sketched elements and more made with the greatest care, full of goodies for you to get stuck into and design-up a storm. This rustic set is a fantastic addition to any designer’s bag of tricks, packed with items to create just about anything! I sketched, tweaked and polished to include as many topics as possible, from flowers, borders, swirls, frames, animals, cooking, coffee, baking, outdoors, cycling and more! 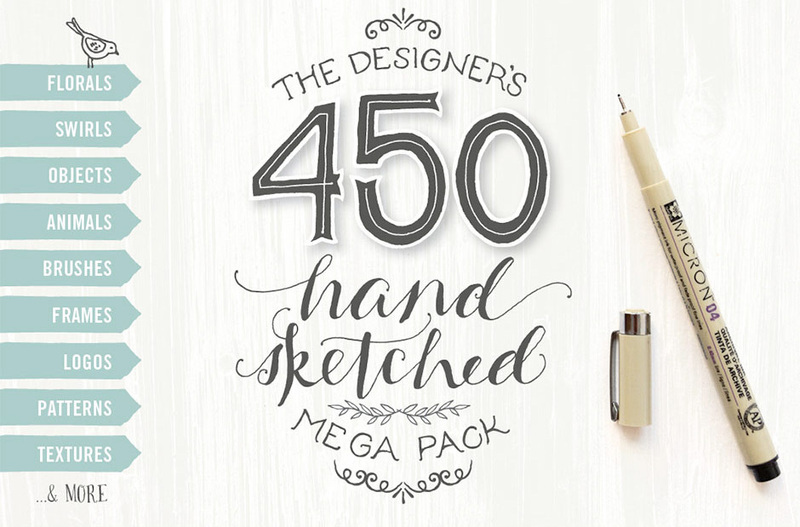 You’ll also find patterns, brushes, textures, hand lettered items and logo templates! Plus 8 pre-made card designs made-up to 5” x 7” (127mm x 178mm) – feel free to scale the vector files to turn them into posters! Because the set is so huge, I made sure to organise the files carefully for you to easily find what you’re looking for. The logos are equally well-organised into layers and only make use of free fonts – the font list with links is included. All files are delivered as .AI and .EPS files. Access the brushes through your Brushes panel: Open Brush Library Other Library and choose the brush file to load. Software requirements: Ai files are compatible with Adobe Illustrator CS3 and newer. EPS files will work on Adobe Photoshop CS3 and newer also. File size is approx 99.4MB (176.4 unzipped), offered as a single download. Software compatibility: Ai files are compatible with Adobe Illustrator CS3 and newer. EPS files will work on Adobe Photoshop CS3 also. I have a query. I was wondering if I create a logo for a client using this pack, can I gave them the original .eps or .ai file of that logo? Or is that against the extended licence? Thank you so much for your comment and our apologies for any confusion caused by our licensing. But I dont have photoshop or adobe. Can it work with Gimp? Thank you for your comment, I am really sorry but I’m afraid that this pack will require Photoshop or Illustrator CS3 for you to work it. I am really sorry for any inconvenience caused! I hope this helps, Marry, and please don’t hesitate to contact me should you have any other questions. I’m always happy to help! I love Lisa’s work, and I purchased this a while back. When I purchased it I didn’t consider the need for a logo, but now I feel the need for one. I could be wrong (been known to happen on a frequent basis), but as I understand DC’s license it says that clipart/vectors/etc cannot be used for logos unless the clipart/ect. is sold for that specific purpose as a kit or something. In the detail section for Designer’s Hand Sketched Megapack, it says there are 8 premium logos. So, my question is, may I use a single part of one of the premium logos (such as the bird from the Sew Sweet logo) to make a new logo and/or may I use a different design element (such as the deer head) for my logo? I will not be selling the logo, it is for my small business. In addition to using the logo on stationery, it will also be on the back of my printable greeting cards, as a water mark on digital products such as printable wall art and as a visible connection between various online sites. Thank you kindly for your comment! I can certainly assist you with your query 🙂 I have sent you a quick email to go into more detail about this. I hope it helps, and if you have any other queries please do let me know. I’m here to help! I would love for this to be available for Photoshop Elements users! Thanks for getting in touch, I am really sorry but Lisa has advised that you would require specific software to work with this item. I apologise for this inconvenience! Hey, same problem here. I love these illustrations and have purchased them in the ” The Essential, Creative Design Arsenal (1000s of Best-Selling Resources)”. Unfortunately I don’t own a compatible software for ai and eps files (I use an old version of photoshop elements and other graphic programmes). Are these illustrations available as png files as well? Keep up the great work at DESIGN CUTS! Thank you for getting in touch. I really hate to be the bearer of bad news here but I’m afraid that these illustrations would not be available as png files. Lisa has stated that you would need specific software to access these elements. I am so sorry for this inconvenience. Thank you for your kind words, please don’t hesitate to contact me should you have any other questions. I’m here to help! I love this pack – it’s just what I need for my homemade beauty products. However I’m not a pro graphic designer & don’t have Illustrator or Photoshop. I do have PSElements though. Is there a version of your artwork that will work for me? Thank you for your comment, I am so sorry to disappoint you on this one but unfortunately there is not a version of this item available for Elements. We always list the compatibility of all of our marketplace items and I’m afraid that the designer has stated that you would need Photoshop/ Illustrator CS3 to access this item. I apologise for this inconvenience. If there is ever anything else I could assist you with please do get in touch. I’m always happy to help! It’s absolutely no problem at all and there is no need to apologise!